The Prayoga can be performed by following the simple procedure given below. 1] The Navagraha Shanti Prayog should be started on any Sunday. 2] The practitioner should get up early in the morning and have a full body bath and wear white colored cotton clothes for performing the Mantra Prayog. 3] The practitioner should sit down on a white colored cotton sitting mat, facing the East Direction. 4] He should place a Navagraha Yantra on a Puja-Board, which is covered by a white colored cotton cloth. 5] The practitioner should apply a Tilak of Kesar on the Navgraha Yantra and light an incense stick and Diya of Pure Ghee, in front of the Navagraha Yantra. 6] He should then commence chanting the Navagraha Mantra shown in the image. This Mantra has to be chanted 51,000 times, in order to fully energize and unleash the full powers of the Yantra. The Mantra Chanting can be completed by taking a Sankalp to chant a fixed number of Mantra Chants per day, but once the Sankalp has been taken, one should not deviate from the committed number. 7] After, the first day, the Mantra Experiment can be continued at anytime during the day or night. 8\ A Spathik Japa Mala should be used to count the number of Mantra Chants. 9] After the completion of the Mantra Experiment, the energized Navagraha Yantra should be installed in the Puja Place or Altar. 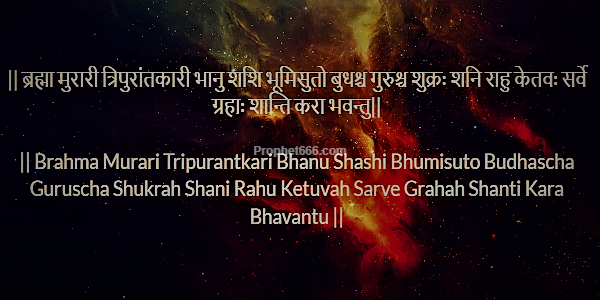 Note- The Mantra given in this post is an all in one Mantra to appease and placate all the Nine Planets at the same time. गुरु शुक्र शनिभ्यश्च राहवे केतवे नम : . नवग्रह अनुकूल रहें,हमारे जीवन पर प्रतिकूल असर न डालें .इसके लिए उनकी पूजा आवश्यक है .बताए अनुसार नवग्रह शांति प्रयोग कीजिए,नवग्रह यंत्र को प्राण प्रतिष्ठित कीजिए चिंता तनाव से मुक्त रहिये.प्रतिदिन प्रात:नवग्रहस्तोत्र के 9 श्लोकों का भी पाठ किया कीजिए. Sir please help me. My husband when gets angry, becomes mad and starts hitting me. He even hits himself. And when he is OK, it's like there is no other good person than him. I really don't understand why he gets aggressive at such pity issues. I want to live a happy life sir. Our kundli's don't match and I am worried about our child as what he will learn after seeing his father hitting and abusing his mother. Please any one here who reads my comment, kindly tell me any mantra or prayog which I can perform easily. I really am afraid of using these vashikaran mantras. So please help me out in this. आपके पति नित्य रात्रि मे सोते समय एक तांबे के लोटे मे जल भर दें और उसमे चाँदी का एक सिक्का डाल दें .प्रात:मुहआदि धोकर इस जल को पिएं .कुछ दिन ऐसा करें ,स्वभाव सौम्य होने लगेगा . घर मे इस तरह क्लेश और अशांति न हो,इसके लिए आप आदित्यहृदयस्तोत्र का पाठ करें . Apka bohot dhanyawad.. Kya main strotra Hindi me bhi path kar Sakti hu? Ya Sanskrit me Hi achha hoga? Any idea how much time it takes to complete 51000 times and can we take a break in between ?